Leba III by Lebalab Inc.
How Does Leba III Work? Leba III safely balances the chemistry of the mouth without destroying the natural, healthy flora in the saliva. It was developed to eliminate the need for periodontal work, which often must be done under anesthesia, posing a serious health risk for many (especially senior) pets. 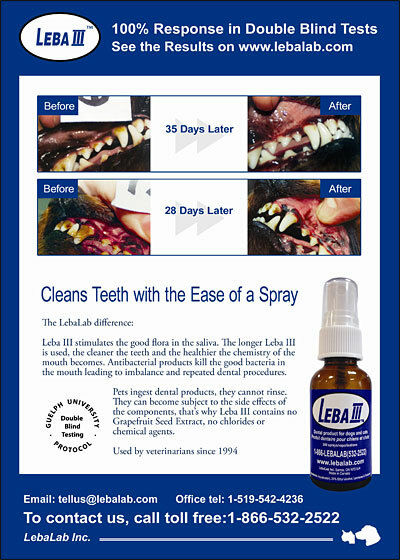 Nothing restores dental health like Leba III! LEBA III is a unique, safe, dental spray for dogs and cats, that balances the chemistry of the mouth and it keeps the teeth clean and the gums healthy for the entire life of your pet, without side effects. The key to health is balance. Products that kill bacteria have an antibiotic action, which damages the natural environment of the mouth. Leba III stimulates enzymes found in saliva to change the chemistry in the mouth. The tartar will soften and cause the plaque and tartar to slip off the teeth. Be consistent and persistent with treatments and use no other chemical products. The double blind testing with Guelph University showed a 100% response. Keeps your pet's teeth clean with just 1-2 sprays twice a day, at least 4 hours apart - morning and night is a good schedule. The active ingredients in Leba III are herbal. It contains no chlorides and no Grapefruit Seed Extract. How Do I Administer The Initial Treatment? To clean teeth initially, give treatments twice a day. Spray directly on the tongue, not on the teeth. You should see improvement in 4 to 6 weeks, but continue twice a day until the teeth are all clean. It will take more or less time depending on your pet's breed, age and genetics. Then proceed with the maintenance program. Every pet has a different chemistry, so the maintenance schedule will vary. After the initial cleaning, space out the treatments gradually, until you find the correct frequency for your pet. Some pets will require daily treatment while others may require it less often. If the tartar comes back increase the frequency. Do not to use Leba III with any other dental product, most of the other dental products have chemicals (antibacterial ingredients) that will destroy the herbal action of Leba III, which is promoting good flora in the mouth. Antibiotics also interfere with the herbal action of Leba III. Distilled water, Ethyl alcohol 25%, Lamiaceae (Mint) and Rosaceae (Roses). All the ingredients are human grade. The quantity & frequency will be on the instruction sheet that comes with your Leba III. If your pet has heavy tartar: you will give two treatments per day until the teeth are all clean Then you will go on maintenance, usually one treatment per day although some pets who are prone to building tartar do remain on twice a day, all the time. There are no side effects. It has been used since 1994 by veterinarians in Canada with no side effects. What Do Customer Say About Leba III? Have used Leba since my 3-yr old goldendoodle was a puppy. No signs of either plaque or tartar buildup. Worth the expense to avoid expensive dental work in later years. Leba 111 dental spray is amazing. It saved my 3 year old cat's teeth from being pulled. I used the spray as directed and the 1/8 inch thick plaque came off her teeth in under one week. I was able to take it off with my fingernail! Your dog's health is greatly affected by the health of his or her teeth. Keeping their teeth free from disease and tartar can drastically improve the quality and longevity of their life. LebaLab products are in many of the major dog catalogs, and many online retailers! LebaLab Inc sends an eye dropper with each Leba III, but some other retailers may forget to include it, so request it as you place your order. For more information about our product, please contact us today or find us at any of our many local dealers- and let us answer your questions and get your dog started on the path to a better smile and a more healthy life!